Cruising along Whakatane’s river edge last month, I spotted a brightly decorated RV parked up on Muriwai Drive near Whakatane Heads. 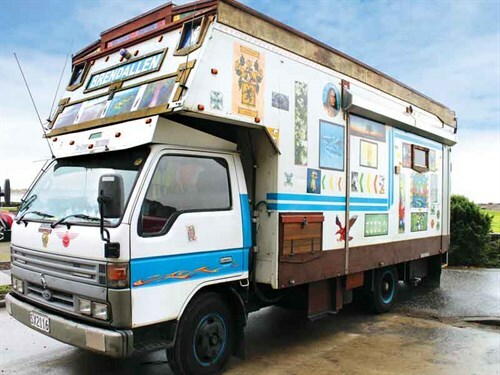 Plastered with pictures, logos and paintings, I just had to stop and find out the story behind this curious and colourful home on wheels. Like many motorhomers, the owners were only too willing to have a chat and share their story. Brenda and Allen (or BrendAllen as they have dubbed their RV) converted their motorhome from an old delivery truck around 10 years ago. Allen tells me he has done everything himself. "I started with a screwdriver and went through the truck, stripping out everything so I could rebuild it from scratch. I stocked up plywood, polystyrene and Pink Batts and then just went to work transforming the truck into a mobile home." 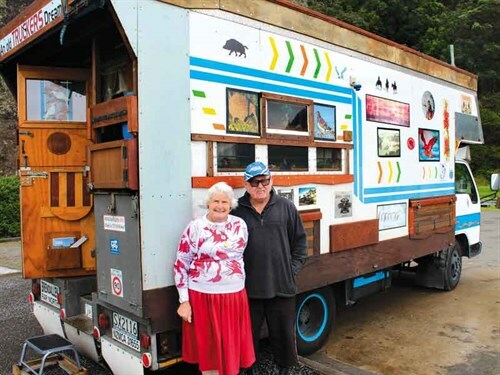 Based in Whangarei, the couple began their motorhoming adventures in the 1990s. 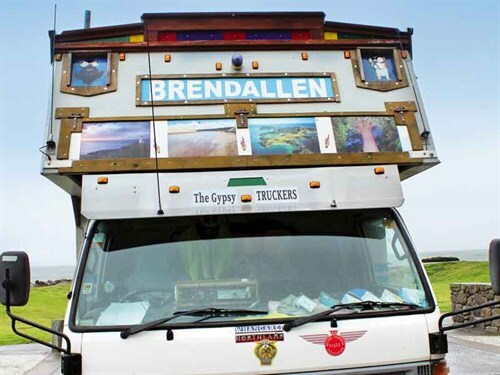 Allen explains that as they travel, he takes photos or picks up pictures and images that he then converts into posters for the side of the truck. "The first pictures were of the native birds we’ve got around the windows. And because we’re members of the Far North Ulysses Club, we decided to have the front of the truck done with images of the Far North." Joining Brenda and Allen on their adventures are Bully Boy and Jackie, a couple of cheeky budgies that ride up front. "Brenda bought the birds for me as a bit of extra company," says Allen. "They seem to love the lifestyle and certainly get plenty of attention as we go around the country." Allen explains that every one of the posters and images on the truck has special significance, perhaps none more so than the beautiful Maori design on the rear of the passenger’s side. 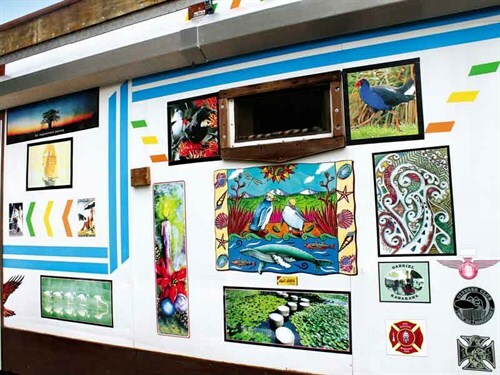 The artwork was done by his grandson and is a source of immense pride for the couple. The couple are longstanding members of the NZMCA and love getting involved in rallies and events. "Whether it’s country and western, or jazz and blues, we love getting dressed up and having a great time with other likeminded travellers." Brenda and Allen will be at the Hokianga Wild West Festival in February, so be sure to keep an eye for them. They’ll be there with bells on… or cowboy hats at the very least.